Most times when we buy things for the house, HandyMan and I weigh if its a "want" or a "need". We don't want to accumulate too much stuff and for the most part, we're pretty good at filling our home with things that fill both criteria. Rarely do we buy something just because of its aesthetic beauty, just because we have to have to have to have it. Well, sometimes you just have to give in to that urge. We bought this totally-cute-but-totally-unnecessary hot air balloon for Chloe's room. For now, it sits hanging from the window shelf where Chloe can watch it as a soft breeze sets it swaying to and fro. Yes, I know that it will be many years before my little one can appreciate the prettiness of this thing. But sometimes mom and dad have to be a little indulgent ;o). 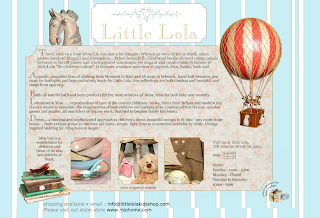 We found the balloon at the cuuuutest store, Little Lola. The store focuses on vintage toys and natural organic and wooden products. Its worth a visit if you're looking for unique and meaningful gifts for children. Ohhhh it's darling!! So whimsical. There's something so magical about a hot air balloon.....one can just imagine dreaming and drifting away in it. Perfect for a little one's imagination. Oh, it is lovely! I can see why the "want" won over the need with this one. My best friend got the same on in orange. I love it. Thank you for introducing me to this website! I'm expecting my first child in January and am having such a difficult time coming up with ideas for his/her new space. I went to a hot air balloon festival this weekend. There were artisan making all size and all sort of miniatures. Yours is lovely, I got to check that site out!